Music is one of the most important fields in Education. From physical to spiritual, music plays an integral role in our personality development. It allows us to express our needs and desires through song as well as gives us an insight into some of the interesting aspects of our history. Music also gives us avenues to develop other aspects of our minds by giving us a multi-faceted form of expression that helps us relate to our World in a better manner. Throughout the year, presentations are made by scholars on various occasions (Indian and International) that develops their presentation skills. Scholars enthusiastically practice and conduct musical presentations in conjunction with multi lingual celebrations. Competitions both at Intra and Inter school level are conducted to encourage children in this subject, our Multi-cultural festival called ‘Landmark’ is a large platform where our scholars showcase their learning. Scholars can either learn Western Contemporary Music (vocal and instrumental) or Indian Classical Music (vocal and instrumental). 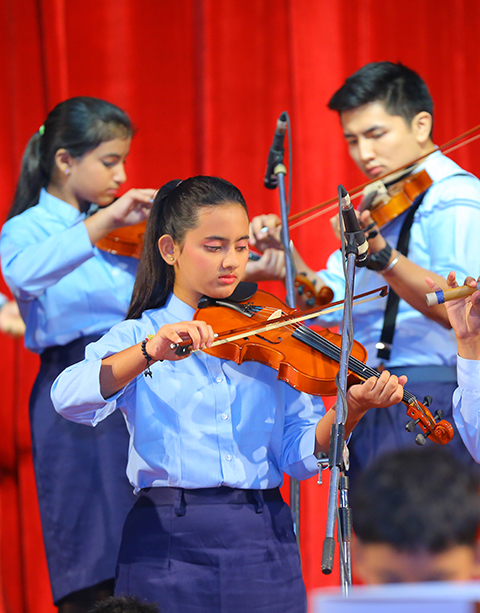 They are also given the opportunity to pursue an instrument of their choice – guitar, drums, synthesizer, piano, flute, tabla, violin, harmonium, sitar etc. Piano classes are held twice a week during the Extended Day Programme. Scholars graduate in piano levels by giving grade exams from Trinity College of Music, London.